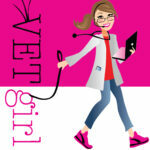 In today's VETgirl online veterinary continuing education blog, Dr. Kathy Rausch, emergency veterinary guru at Animal Emergency & Referral Center of Minnesota, shows her new invention the "Kathy Cat Cave." This is a perfect, easy-to-make, reusable, easy-to-disinfect creation you can use in your clinic to help minimize the stress in those scared cats that are hospitalized for therapy. Check out this video here to learn how to make this to provide a fear-free, stress-free environment for your hospitalized feline patients! Such a lovely idea dr Kathy, you seem to be a wonderful vet! So nice to share! Great idea! Brilliantly simplistic solution to reducing stress for hospitalized cats!! Thank you for acknowledging and working to finding a solution utilizing common everyday products to help hospitalized cats (especially in Emergency facilities). If there was an award I could give for best ideas, please do know you would receive it! LOL. A medium to large men’s.